Film-Arcade.net: Stars Catherine Corcoran and Asta Paredes Will Be at the L.A. premiere of "Return to Return Nuke Em' High aka Vol 2"
Stars Catherine Corcoran and Asta Paredes Will Be at the L.A. premiere of "Return to Return Nuke Em' High aka Vol 2"
Troma Entertainment recently released information about the L.A Premiere of "Return to Return Nuke Em' High aka Vol 2". The film's stars Catherine Corcoran and Asta Paredes will be at the L.A Premiere of the film. along with director Lloyd Kaufman and many more guests. The L.A. premiere of the film will take place at the Laemmle's Ahrya Fine Arts on March 8th at 7:30pm pst. There will also be a Q & A after the screening. The film then be screening daily at Laemmle's NoHo 7 from March 9th - 15th at 9:55PM each night. Stars of "Return to Nuke 'Em High Vol. 1 & 2", Catherine Corcoran and Asta Paredes will be attending the LA Opening of "Return to Return to Nuke 'Em High aka Volume 2" on March 8th at Laemmle's Ahrya Fine Arts. Corcoran, Paredes, Lloyd Kaufman and many more guests will be panelists during a special Q&A following the screening of "Volume 2" at 7:30pm - it was announced today by Levi White, Director of Public Relations for Troma Entertainment, Inc. 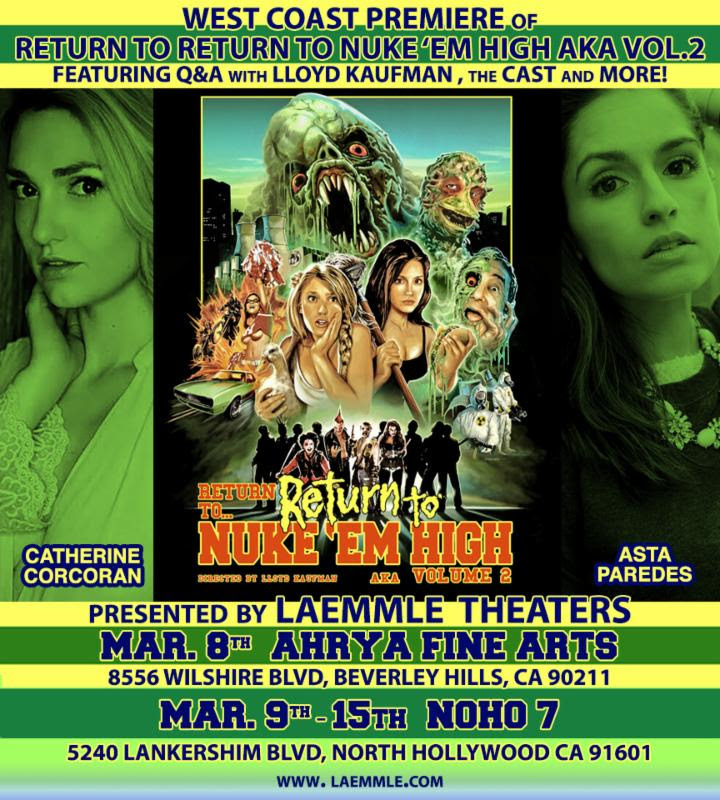 The much anticipated "Return to Return to Nuke 'Em High aka Volume 2" will open in LA at Laemmle's Ahrya Fine Arts on March 8th at 7:30pm. The film will then screen daily at Laemmle's NoHo 7 from March 9th - 15th at 9:55PM each night.